A striking image of an enormous bubble blown into the dusty gas disk of our own Milky Way galaxy has won first place in the National Radio Astronomy Observatory's second annual Radio Astronomy Image Contest. Dr. Jayanne English of the University of Manitoba led the team that made the winning image using data from the National Science Foundation's Very Large Array (VLA) in New Mexico and Robert C. Byrd Green Bank Telescope (GBT) in West Virginia. English and her collaborators Jeroen Stil and Russ Taylor, from the University of Calgary, will share the grand prize of $1,000 from Associated Universities, Inc., the research corporation that operates the observatory for the NSF. "We congratulate Dr. English for producing an outstanding image that beautifully illustrates the power of our radio telescopes," said NRAO Director Fred K.Y. Lo. The image contest is part of a broader NRAO effort to make radio astronomical data and images easily accessible and widely available to scientists, students, teachers, the general public, news media and science-education professionals. That effort includes an expanding image gallery on the observatory's Web site. 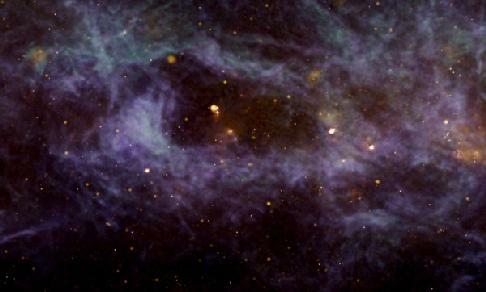 English's winning image shows a giant bubble in the Milky Way's dusty gas disk. The bubble has been sculpted by the wind and radiation force from a few dozen hot, massive stars along with the explosive force of supernova explosions from dying stars. The bubble, seen in the faint radio glow of hydrogen gas, is some 30,000 light-years from Earth and measures 1,100 by 520 light-years. If the bubble, in the constellation Vulpecula, were visible to human eyes, it would appear to be eight times the diameter of the full Moon in the sky. The image was made using data collected as part of the VLA Galactic Plane Survey (VGPS), a set of systematic observations of the Milky Way. This survey, led by Taylor, required about 3,000 separate VLA observations taking 260 hours, augmented by data from the GBT. The VGPS is part, along with the Canadian Galactic Plane Survey and the Southern Galactic Plane Survey, of an international effort to produce a detailed atlas of our home Galaxy as seen by radio telescopes. Second place in the contest went to Fabian Walter of the Max Planck Institute for Astrophysics in Heidelberg, Germany, for a collection of galaxy images. Honorable Mentions were awarded to Michael Bietenholz of York University in Canada, Joeri van Leeuwen of the University of British Columbia, Neal Miller of NRAO and the Johns Hopkins University, and Yurii Pidopryhora of NRAO and Ohio University.